On that day, on Korean BBQ night, we had about 6lb of meat and luckily, our calculations were right and all the meat were all gone. 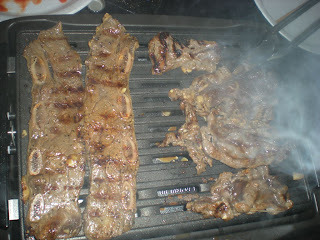 Mainly, we had Kalbi which is marinated shortribs and Bulgogi, boneless meat, this can be flank steak, loin or boneless ribs. Here is the recipe from my Taiwanese's Korean friend. 1. 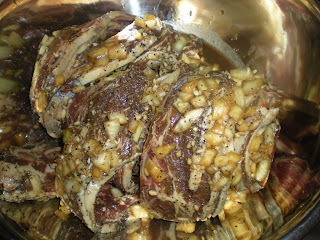 In a large bowl, combine garlic, onion, brown sugar and black pepper. 2. Add soy sauce, sesame oil and honey to the mixture. 3. Put meat in a large ziploc and then pour the marinade. Toss to marinate the meat. 4. 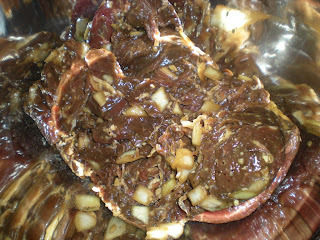 Marinate for 1-2 days. 6. Cook meat for 2-3 meats on each side. To eat like a real Korean, wrap the meat with romania lettuce, roasted garlic and seaweed. Serve with rice with Korean red sweet and spicy sauce (Gochujang). Who says Koreans don't have a sweet tooth? That's a lot more sugar than I put in my kalbi and bulgogi. 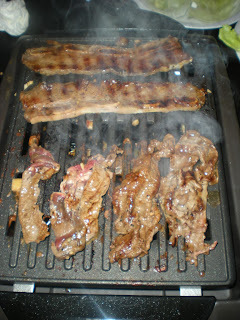 Love Kalbi and Bulgogi! This sounds great. I actually thought it was a typo in the amount of sugar. I had to call my Taiwanese friend to confirm it. It seems that it is the right amount.